In addition to this page, you can also read the latest news on Twitter and Facebook. I made a few minor updates throughout the website today. One of the changes I made was to make it easier to post news updates, which I hope to do more frequently now, both about development and other random things. Today marks the 10 year anniversary of the first public release of PEMDAS Dashboard Widget! Probably not a huge deal in the grand scheme of things, but I thought it was worth a note (especially since I haven't posted in a while). I also put screenshots of the original release below for fun – it looks different, but surprisingly a lot of the basic functionality was there. 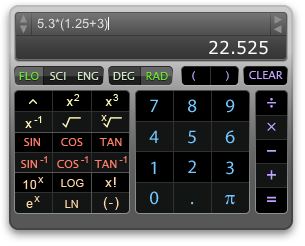 Back when Mac OS X Tiger was released, I put together some initial layouts for a calculator widget, but didn't start actually developing until early January 2006. I was in college at the time, and I wrote PEMDAS to help me with my engineering classes – I remember one of the first times using it after it was (mostly) stable was on an aeroelasticity exam. It worked pretty well, so I kept developing! One of my friends from college suggested the name PEMDAS, and another one helped me beta test to get it ready for the first public release, which I called version 0.9. A year, several updates, and lots of feedback later, I won an Apple Design Award for Best Dashboard Widget, runner up, which was really great. Then in February 2009 I released the PEMDAS iPhone app, which in all honesty hasn't been as successful as the Dashboard Widget, but I'd argue is the better app of the two. Overall it's been really fun, and I've really enjoyed all the e-mails and people I've talked to about it over the years. 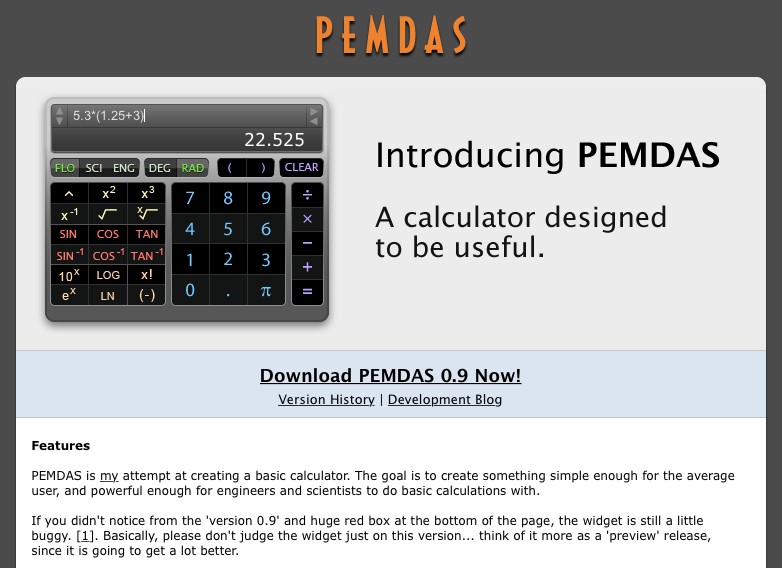 The tagline of the PEMDAS website back in 2006 was "A calculator designed to be useful", and I hope it's been that to those who have used it. Last spring, I took a temporary break from writing code for PEMDAS to focus on a few software side projects at my day job. Unfortunately the temporary break has lasted longer than I wanted it to – the software projects keep coming and regular work continues to be busy, and combined with life outside of work, I haven't had enough free time to do any significant development. It's also a little discouraging that the App Store isn't a good experience for both developers and customers, and there isn't really a sense of community there, but that's a little besides the point (and a topic for another day). In any case, development on PEMDAS definitely isn't dead, just a little slow right now. Hopefully I'll have more time to work on it over the next few months, and can push out at least small update this year. In the mean time, thanks for reading, and thanks to everyone who has used PEMDAS over the years! PEMDAS Touch 1.5.1 has been released! This is actually a deceptive update; on the surface, nothing should seem like it's changed (unless you happen to notice the minor tweaks to the icon), but behind the scenes, it was a lot of work. The first change was I updated the app so that it is iOS 7 only. While this simplifies the code, the primary reason I did it was because I didn't want anyone purchasing the app on iOS 6, and then be disappointed when most future features are iOS 7 only. I apologize to those running iOS 6, but the previous version was a nice stable update to stop at. However, the big update was to part of the PEMDAS backend. 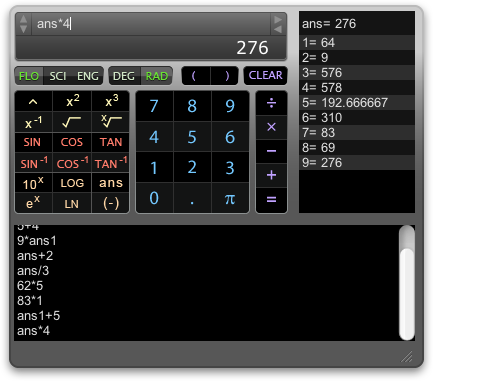 Internally, PEMDAS is two separate components; there's the interface, and there's the calculator backend. In this update, roughly 1/3 of the backend was rewritten to be significantly faster and more versatile. It won't make much of a difference in this update, but it will be useful in the future. Let me know if you experience any issues with the update, and stay tuned for an update to PEMDAS Widget, coming very shortly! Just a quick update to say the website has been updated! This new design is much cleaner, and is now fully retina-compatible. 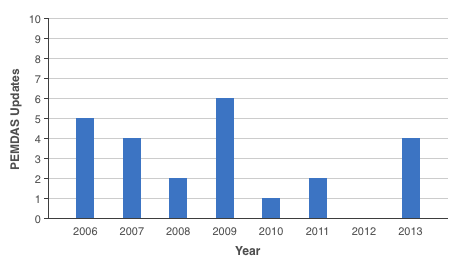 For updates, 2013 tied the record—six updates were released (five PEMDAS Touch and one PEMDAS Widget). And there's still a lot of work to do—I'm looking forward to 2014! I think it's going to be a great year. If anyone wants to beta test an upcoming major release of PEMDAS Widget, let me know ASAP. I've gotten several e-mails from people who like PEMDAS, and ask how they can help support development. First, I just want to say that it's really nice (and flattering!) to hear when someone likes using PEMDAS – it's a lot of work, and our ultimate goal is to make an app that's easy and useful for you to use. If we do our job right, you'll have a hard time going back to the old way of doing things before you started using PEMDAS! Buy PEMDAS Touch. If you have an iOS device, buy PEMDAS on the App Store. This is a win-win... you get an app that you'll (hopefully) get use out of, and we get additional income to pump back into PEMDAS development. We really want to make this a sustainable business, which will give us a greater ability to invest in the development of new features. Rate/Review PEMDAS Touch. If you purchased PEMDAS from the App store, it would be great if you could rate PEMDAS and/or write a review. It's helpful to other customers browsing the app store, and it's also a factor in Apple's search and ranking algorithms. Provide feedback. PEMDAS isn't perfect, so whether it's good or bad, it's great to hear what other people think about PEMDAS! You can use the contact form, or Twitter/Facebook. I read every e-mail I get, and I try to respond to all of them. For new features in particular, it's worth noting that a good amount of the features added to PEMDAS have been directly or indirectly influenced by feedback. Tell your friends about it. If you know someone who has an iPhone or Mac who you think might find it useful, feel free to mention it! A lot of the apps we really like we've heard about through our friends and blogs we've read. PEMDAS Touch Version 1.4.1 released! Fixed a bug in the Settings tab where two extra number formatting options were shown, but not implemented -- they would take you to the degrees/radians preference if you tapped on them. Fixed a bug where if you modified the degrees/radians preference in the detail view of one of the unimplemented formatting options described above, the degrees/radians preference back in the main Settings tab view might not reflect the updated setting. Added a number formatting option is the Settings tab to modify the exponential character to be "e" or "E" (so, for example, a number could be shown as 6.02e23 or 6.02E23). This was also the first update released with a new in-house bug tracking system. Over the years I've tried a lot of different ways to keep track of open items during development: pen and paper, a text file, an in-house Cocoa app, and an in-house web app. Recently I looked at commercial systems (including FogBugz and Lighthouse), but found them to be too complicated for what I needed. A few weekends ago, I wrote a web-based app, and so far it's a definite improvement over what I was working with before. I'm hoping this new system will help make development a little easier and faster, to help reduce the time between updates. As I said earlier in the year, I've been moving from larger, more infrequent updates to smaller, more frequent updates. When development on PEMDAS first started back in 2006, I had been releasing lots of smaller updates, but somewhere around 2010, I moved away from that. It culminated last year in the release of 0 updates, which was pretty abysmal all around, and not at all how I want things to be going forward. Including PEMDAS Touch Version 1.4.1, there have already been 4 updates this year. And I feel like things are just getting started – I'm pretty sure this is going to be a big year for PEMDAS, and I think you're really going to like what's in the pipeline! PEMDAS Touch Version 1.4 released! Added ability to adjust the selection in the keypad text field. Added ability to copy/paste text in the keypad text field. Added ability to copy the result (just double tap it). Updated the keypad to have a slightly cleaner look. Fixed a few minor interface bugs. I think you'll like this update, and thanks for all the feedback! I plan for this to be a busy summer and fall, so stay tuned; there are a lot of really great things in the pipeline. As always, if you have any issues with this update, definitely contact me. You can also reach me on Facebook and Twitter. Links have been added to the bottom of the pages for our Twitter and Facebook pages. I'm not quite sure how the Facebook/Twitter pages will work out, but hopefully it might be useful for those of you who are on those sites -- feel free to contact us there, and we'll probably also post development updates/notices when we release updates! Speaking of updates, stay tuned. Unfortunately due to my work schedule over the past month, the next update to PEMDAS Touch has taken a bit longer than initially expected, but it should be out very soon. A quick update was just released, which includes a fix for a bug where the keyboard would not redraw correctly after rotating your iPhone or iPad. Work is progressing on the next update, 1.3.2, which will include some tweaks and new features. Stay tuned!